The Canadian forces plus a little added support: a FOO in a carrier with 4 x 25pdrs on call, a Vickers on another carrier, and air support. The remains of various units desperate to hold Lambert. Added a FOO in a SdKfz 250 with a couple of mortars, a sniper, a Sdkfz 251, and a 20mm flak on a SdKfz 11. The Tiger is just visible top left, the Panther is behind. There is a German squad in the garden of the row house in the centre and another in the white farm building behind. The British enter top left. The R.Dives is bottom left and the main road from Falaise crosses left to right. The Canadians enter top left, initially with a platoon of Shermans and infantry. The plan is to advance a tank/infantry force up either side of the top road through the panted field and orchard to seize the crossroads. First blood to the Panther, just off cam on the right: a smoking M4. 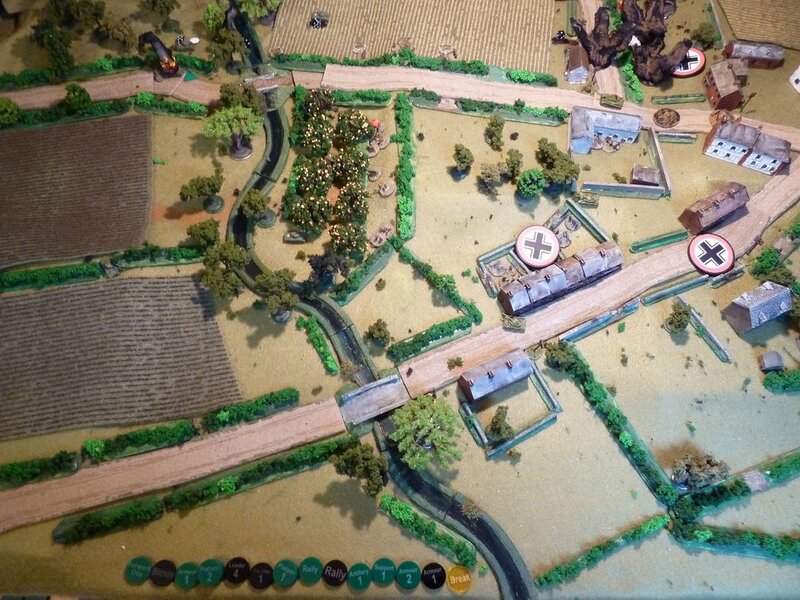 The Canadian second force heads across the ploughed field aiming to cross the river and find cover in the orchard. Quickly spotted by a German sniper tied to an apple tree. Crossing the ploughed field is slow going and the sniper further slows the Canadians with plenty of shock and pins. The Canadian FOO and Vickers head for the high ground on the left. The view from Lambert down the top road. The Panther has moved forward to cover the fields. The Tiger covers the road with the burning M4 visible. Another Sherman in the field has been hit repeatedly and the crew bailed. The Canadian FOO brings down a barrage on the Tiger...but it has no effect. German reinforcements move up the main Falaise road under Blinds. As more unit chits get added to the mix, the Blinds come up less frequently and they move very slowly. The two German big cats pin down the Sherman platoon in the wood top left, bailing a Sherman and knocking out the Firefly in a duel. The FOO switches the 25pdrs to the Panther: again no effect. The Canadian 1st infantry platoon are moving up the hedge line at the top and the 2nd has crossed the R.Dives and pushed through the orchard to the hedge line centre with more Shermans in support. A couple of Pz IVs and squads have arrived and reinforced the position in centre around the row house in the centre. The 1st section and PIAT gunner dash forward and take a shot at the Tiger: and misses badly. An attempt to use 2" mortars to blind the Panther scatters to behind the tank. The section are sitting ducks in the open! On the hill a Firefly spots a Pz IV trying to work around the flank of the Canadian 2nd Infantry platoon...an easy kill, the smoke from the panzer visible amongst the houses. An RAF Typhoon arrives and fires a pair of rockets at the Panther...BOOM! Direct hit! The Canadian 2nd infantry and Shermans shoot up the Germans in the gardens of the central row house and start to pulverise them with 75mm and a hail of .303 (4 dice because of veteran status) after knocking out the remaining Pz IV. The Tiger charges forwards and catches the Canadian 1st platoon in the open: a hail of MG fire rips into the 1st section! The Canadians in the field flee across the hedge and the road. They take fire from the Germans in the barn and the remains manage to get into the orchard. A Sherman moves forward toward the barn and a shot from a 'faust misses. Luckily, the Typhoon returns for another run and gets another direct hit, this time on the Tiger! The spotting round in the middle is from a German mortar battery. It never managed to get on target. Game over. Four german panzers wrecked, two squads routed and the Canadian 2nd infantry platoon with four supporting M4s, ready to push on into the buildings...not enough left.